Galloway Township Police Chief Patrick Moran announced today the results thus far on the designated "hot spot" detail initiated by the Department on Friday July 19, 2013. Chief Moran initiated the detail by assigning officers who would be utilizing plain clothes tactics and uniformed patrols to detect, investigate, and deter illegal activity and address some traffic related issues in areas that have been identified through calls for service, complaints, statistics, etc. 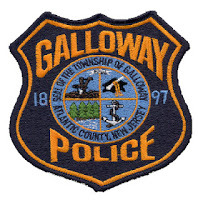 From July 19 to August 3, the Galloway Police initiated five (5) (2 Officer) 4-hour proactive details in areas that were determined to be in need of extra police presence using forfeited money from criminals. Officers have been patrolling these areas of concern in both uniform and plain clothes. As a result eight (8) people were arrested. The Police Department is also mixing in traffic enforcement and so far in three (3) 3-hour details, the officers have stopped 23 vehicles and issued 8 summonses. The details will continue to be scheduled throughout the Township and the department will continue to mix both uniform and plain clothes details, which will vary throughout the week. “To date, the details have been successful. They allow the officers to be more proactive because they are not handling calls on the street; the warrant arrests, several CDS (Controlled Dangerous Substance) arrests, and the robbery arrests are directly related to having the detailed officers out there” Chief Moran said in a statement issued. “Without the detail, the robbery suspects from Saturday night may not have been caught. The detailed officers were able to take a proactive approach at locating the suspects and it worked. Otherwise, locating the suspects would have been left up to a very busy patrol shift, which would only be able to look for the suspects between answering calls" Moran said. Moran further stated, "The officers of this department are and always have been proactive while on regular patrol. When they have the opportunity to be detailed to something like this, they take it up a notch or two.The arrests speak for themselves. As always, the officers of this department are out there doing a great job, “doing what they do best “, and they are among the best at doing it." Great job gtpd... We want our town back! Police do outstanding job. in spite of Purdy lining his pockets and his family and fellow political hacks pockets. he should be in jail. thank God he will be gone for ever on jan 1. Proud of our Police Department. With all the latest negative publicity, its good to see Chief Patrick Moran stand behind his men, even if there are problems. Rs ds and u s want Purdy gone now. Purdy will fire liston before end of year. tyrell and coppola both turned out to be stooges. what a shame. city hall employees r , d and us deserve much better fate than Purdy and liston. they line there own pockets with no regard for employees and taxpayers. now, Purdy and liston take over Absecon. where have u gone mike blee. two lonely taken over by two thugs turns their lonely eyes to you. I don't know how coppolla and dr. mister, poobaa tyrell sleep. hey ulman , how did council turn out for you? whoops you didn't $$$$ benefit at all , like u thought u would. go back to selling beads and baubles. last post is dead on. Purdy implodes in mid September. cowards tyrell and coppola wimp out as usual and nothing. ulman realized being on council is not what she expected. there was no financial gain 4 her. she never learned from Purdy to use your position to line your and your yes mens pockets. the last 4 years must have been hard on her as there wasn't the financial gain she expected. in last ditch effort Purdy fires liston after making him scapegoat for all the problems Purdy created. again, the two wimps, tyrell and coopolla stand by and do what they akways do. nothing. mike blee intercedes thru buffers to save Absecon before Purdy and liston ruin Absecon like they did Galloway. where have morons price and Mitchell been ? Galloway actually misses bill trask now. bill was rough around edges but cared about Galloway. he would be challenging Purdy at council if he was alive. haven't heard from hillbilly giberson for a while. why does deny always praise this ignorant bumpkin ? Haha. Try finding Purdy. Where has Rossi been? He only comes out when his buddy Franko gets called out. Guess our local business guy doesn't support the mayor. Bahahahha. Calling out OPRA requesters too. Purdy did that and got sued.